Well, drawing is apparently becoming a cool thing to do! Or at least colouring in… as this Guardian article demonstrates. The appeal of colouring is apparently the way it relaxes the brain, and the book publishers urge people to “take a few minutes out of your day, wherever you are, and colour your way to peace and calm”. Brett Williamson of ABC Radio 891 felt there was a direct connection between this compulsive colouring-in craze and the growing trend for adults to seek beginners’ drawing classes, so he came to our Drawing for the Terrified class at Pepper Street Arts Centre to find out what it was all about. 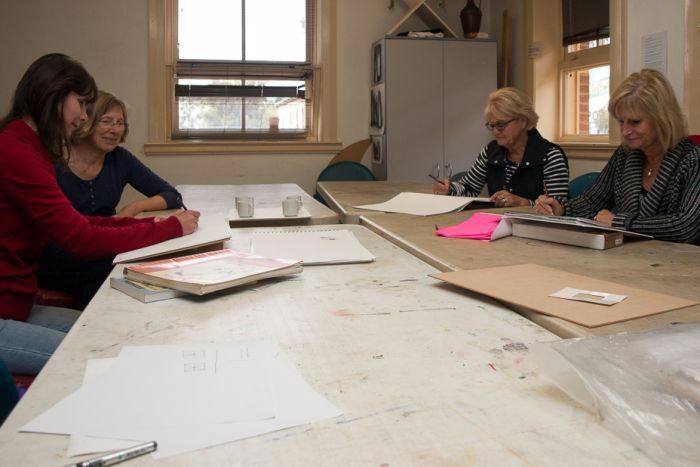 To his great relief we didn’t sit him down and draw his portrait, but to my great delight my students were pleased to confirm that the drawing classes are not only relaxing, but also genuinely rewarding. I think drawing takes us many stages further than colouring in: in addition to relaxing the mind, it stimulates the imagination and shows us how to look at the world in ways we had never thought of looking before. Above all, it helps to relax us by challenging us: rather than merely being careful not to go over the lines, we have to engage both sides of the brain to understand how to translate a three dimensional object into an image on a two dimensional piece of paper. People often compare a drawing session with a physical workout, while colouring-in is more akin to yoga or massage.